No component in a gaming desktop PC is safe from the RGB LED lighting trend. SSDs with LED lighting have existed as a tiny niche for years, but now that motherboards are integrating lighting controllers, that product segment is expanding significantly. 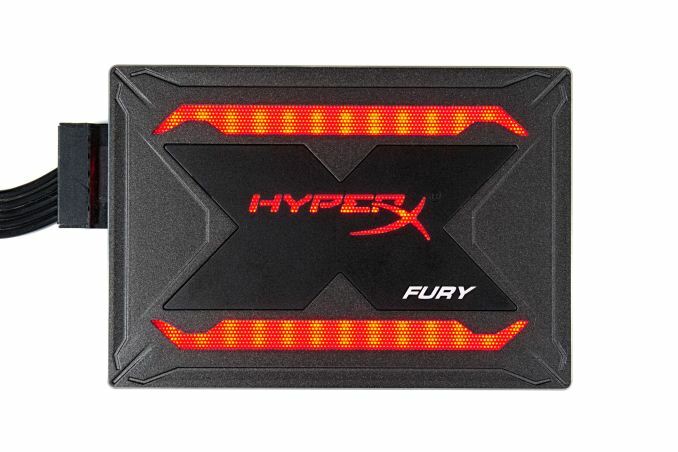 Kingston's HyperX gaming brand is introducing the Fury RGB SSD to capitalize on the seemingly unstoppable (and oddly lucrative) trend. 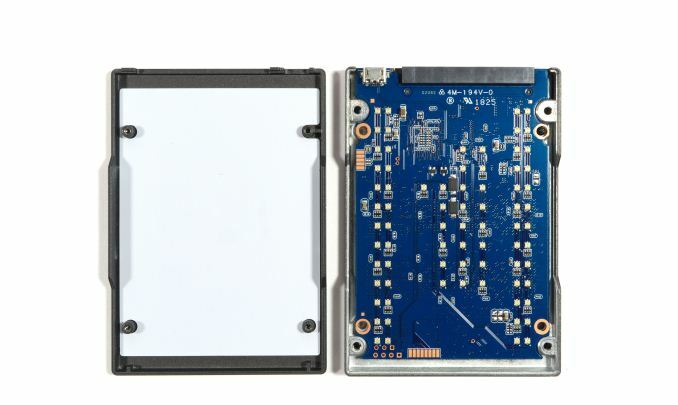 The original HyperX Fury SSD was released back in 2014 and used a SandForce controller combined with 20nm planar MLC NAND. This new HyperX Fury RGB SSD has almost nothing in common with that older drive on the inside, though the non-LED parts of the visual styling are quite similar. The Fury RGB uses current-generation Toshiba/SanDisk 64-layer 3D TLC NAND and Marvell's 88SS1074 controller. The lighting on the Fury RGB is controllable through a connector next to the SATA power and data connectors. Kingston used a USB micro-B connector here, but it's not electrically compatible with USB. Instead, the adapter cable included with the drive must be used to connect to a 4-pin 12V RGB header on the motherboard or other lighting controller. This allows the color of the lighting to be adjusted as a group; individual control of the LEDs is not possible. 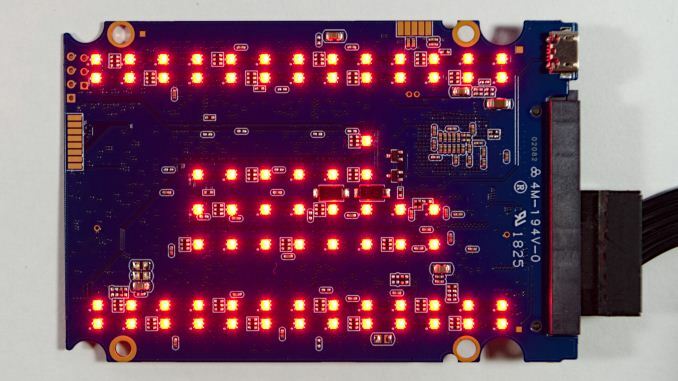 Alternatively, if the LED cable is not connected, the drive will default to illuminating the red LEDs using the 12V supply on the SATA power connector while the rest of the device uses the 5V supply like a normal SATA SSD. The LEDs can also be powered and controlled solely through the LED cable even when the SATA power connector is not supplying any power. The HyperX Fury uses a staggering 75 RGB LED modules internally, mounted on the same PCB as the storage-related components. The LEDs are distributed to provide thorough coverage of the backlit HyperX logo and the edge highlights. The light shines through a thin sheet of white plastic that acts as a diffuser, and the through a perforated sheet of metal that adds some texture to the lighting effect. Those two layers also block a lot of light, which is probably why the Fury RGB needs so many LEDs. The lighting forces the HyperX Fury RGB to be slightly thicker than most SATA SSDs at 9.5mm instead of 7mm. On the storage side of the PCB, we find typical mainstream SATA SSD components. Kingston only provides sequential I/O performance specifications which indicate SATA-saturating peak performance, but they are not saying anything about how performance scales with capacity, nor how things behave when the SLC write cache fills up. The power draw ratings seem to be based on the drive operating with the LEDs off and peak write power of 2.5 W is reasonable for a drive using modern, low-power 3D NAND. The HyperX Fury RGB is warranted for a write endurance of 0.46 DWPD over three years, equivalent to a bit less than 0.3 DWPD if it had the 5-year warranty duration that mainstream SATA drives usually come with. The MSRPs for the Fury RGB reflect a fairly steep price premium for the RGB lighting. The Fury RGB will hit the market with pricing more typical of an entry or mid-level NVMe SSD than a SATA SSD with only a 3-year warranty. Kingston's own A1000 low-end NVMe SSD is currently selling for well below the MSRPs of the HyperX Fury RGB, so the Fury RGB is clearly only for enthusiasts who are willing to sacrifice performance and pay a premium to get the aesthetics they want from their SSD. It's been a while since we received a SATA drive using the Marvell 88SS1074 controller; most of the SATA drives we've been seeing lately have used either Silicon Motion or Phison controllers. The turnkey solutions offered by those two vendors seem to be a lot more popular with the smaller SSD brands than Marvell's offerings. Some of the biggest brands have also been lured away from Marvell, most notably the Crucial M/MX series that switched to Silicon Motion's SM2258 after using Marvell controllers for all their previous high-end 6Gbps SATA SSDs. Western Digital still uses the 88SS1074 controller in their WD Blue SSDs, but they switched from Marvell to an in-house controller for the 3D NAND update to their WD Black SSD. The Toshiba/SanDisk BiCS3 64-layer 3D TLC NAND flash used in the HyperX Fury RGB is a much more common sight on our SSD testbed this year, both in NVMe and SATA SSDs. Virtually all drives using Phison controllers are using Toshiba NAND, and this includes Toshiba's own TR200 SATA SSD with the DRAMless Phison S11 controller. The Plextor M8V is a more mainstream drive, pairing the same NAND with the SM2258 controller. The M8V has been scarce at retailers but its OEM counterpart (Liteon CV8) has been used by major OEMs like Dell. It's hard to decide which drives are the best to compare the Fury RGB against, since most of our SSDs don't have LED lighting. Ignoring the lighting aspect, the drives that are most technologically similar are the Toshiba TR200 and Plextor M8V, SATA drives with the same NAND and different controllers. The Crucial MX500 and Intel 545s are mainstream SATA drives with Intel/Micron 64-layer TLC. The price premium that the LED lighting brings to the Fury RGB brings it up to the level of some of the cheaper NVMe SSDs. 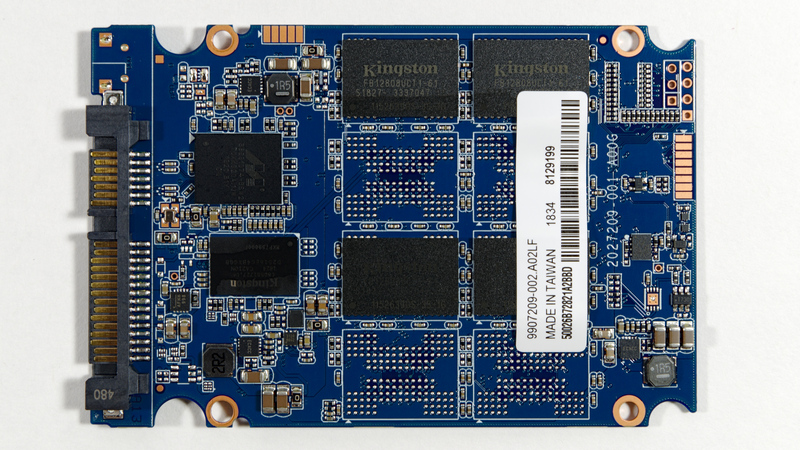 Kingston's own A1000 is an entry-level NVMe SSD using the Phison E8 controlller, and it is substantially cheaper than the Fury RGB's MSRPs. Meanwhile the ADATA XPG SX8200 uses the much higher-performing combination of Micron 64L 3D TLC and the SM2262 controller and costs about the same as the Fury RGB. Our SSD coverage in recent months has been heavily focused on NVMe SSDs as the more active and exciting market segment. As a result, our post-Spectre/Meltdown re-testing of drives has included relatively few SATA SSDs. Most of our small and low-end SATA drives have not yet completed the longer AnandTech Storage Bench tests, so this review has fewer results for The Destroyer and the ATSB Heavy test than we typically include. No, lighting is very important to a segment of that market. Lit DRAM, feet, strings of LEDs and neon inside, and out. Replacing the cover with a clear plastic one(violating the FCC protocols), is very important to them.